Win a FREE iPhone5 by sharing your thoughts on food.. that easy! It’s the countdown to the coolest gadget in town - iPhone5!!! YourFoodReview.com is giving you a chance to make it yours for FREE! As a Penang Lang (Penangite), we always have the passion within as ambassadors to promote tourism and food of Penang. 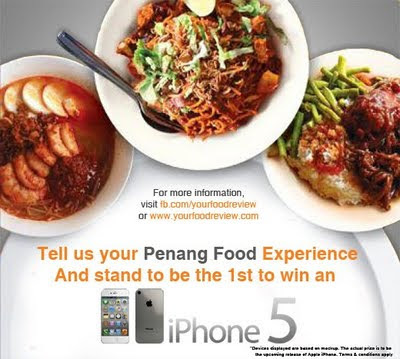 And of course this contest holds the purpose of encouraging people to share their experience about Penang Foods. The iPhone5 is expected to be announce in end September while release in the U.S. in early Oct. So the prize is for real. NOT SOME FAKE CONTEST. Yes, we were there during YourFoodReview.com's website and iPhone/iPad app launching on 13th August, 2011 in Weissbräu, Straits Quay Penang. Time wait for no one so make every second count!